"The 1957 Edition celebrates the Cinquecento, the icon of our brand, and its unique cachet of Italian style, efficiency and engaging road manners," said Jason Stoicevich, Head of Fiat Brand for North America, Chrysler Group LLC. "Created for Italian car and design fans who want an added sense of the historic Cinquecento's spirit, the '1957 Edition' features unique styling elements, material finishes and, of course, a manual transmission and sport-tuned suspension." There's a romance about Italian cars, brands, fashion and design that make goods from this artisan nation among the most coveted around the globe. Since 1957, the Fiat 500 has embodied all four, empowering the Cinquecento to become one of the most iconic automobiles of all time. Fifty-seven years later, and with sales in more than 100 countries, the 2014 Fiat 500 1957 Edition commemorates its roots in uniquely crafted detail. 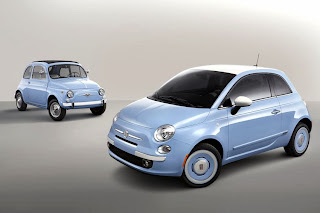 Based on the 2014 Fiat 500 Lounge model, the 1957 Edition enhances its iconic silhouette with a vintage look, thanks to classic exterior colors for this limited-edition Cinquecento, including Bianco (white), or for a bi-color look, Verde Chiaro (light green) or exclusive Celeste (celestial blue) paired with a signature Bianco painted roof and mirror caps. Inspired by the 1957 Fiat 'Nuova' Cinquecento, an exclusive 16-inch retro wheel design features a wide chromed lip, body-color accent and large center cap with historic 'Fiat' emblem. For improved handling, a sport-tuned suspension and all-season performance tires are standard. Completing the look are throwback 'Fiat' badges on the front fascia and rear liftgate. Continuing the 1957 Edition's vintage look is an Avorio (ivory) interior environment contrasted by premium Marrone (brown) leather seats. Avorio accent stitching vertically crosses the seatbacks and seat cushions, while detailed stitching at the perimeter adds to the Cinquecento's craftsmanship. For added contrast, Grigio (grey) door panels feature a unique Avorio inner panel, while Marrone door armrests and shift boot (with manual transmission) are color-keyed to the leather seats for a harmonious look. An exclusive Avorio leather-wrapped steering wheel is hand-stitched with Marrone leather on the 'inner ring', and features a retro 'Fiat' badge, illustrating how Fiat brand takes craftsmanship to heart. Adding to the historic theme is a uniquely styled key fob with Marrone casing and Avorio-painted '1957' graphic. For driving enjoyment, the six-speaker and 276-watt Fiat premium audio system with SiriusXM Radio is also included. The 2014 Fiat 500 1957 Edition features the innovative 1.4-liter MultiAir engine and C514 five-speed manual transmission, delivering an EPA estimated 31 miles per gallon (mpg) city and 40 mpg highway. Like all Fiat products, engaging dynamics are essential, and the 1957 Edition includes a driver-selectable 'Sport' mode on the instrument panel to unleash a more aggressive throttle map. Additionally, an optional six-speed automatic transmission with driver-selectable gear changes is also available. In Sport mode, the automatic transmission offers a more aggressive shift schedule and throttle map for improved engine responsiveness.